Inbound and organic sources of leads are great avenues for keeping your pipeline flowing. But in some situations, these strategies can only take you so far, yet take up so much time. To really grow your sales funnel, an outbound lead generation company can be the sharpest (and sometimes the only) tool in the shed. A lead generation agency’s entire reason is to help you get in front of your target prospects–whether through email, phone, or face-to-face. But regardless of how a lead generation company delivers opportunities, it all boils down to providing you with actionable marketing and sales insights. That’s what separates the best lead generation companies from the rest of the pack. Understandably, having “the most up-to-date” and “the most accurate” database has now become the main selling point that many lead generation companies trumpet. It’s nearly impossible to tell apart genuine value versus hyped-up claims. With the potentially irreparable damage that bad marketing data can do, finding and working with the right lead generation provider is something you need to carefully go over. 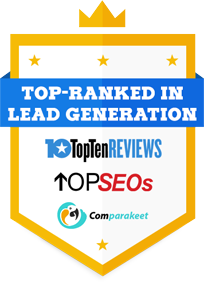 That’s why a list of the top 5 lead generation companies recently published by TechnologyAdvice is a very helpful resource. Plus, we’re also excited to announce that Callbox is part of this list. 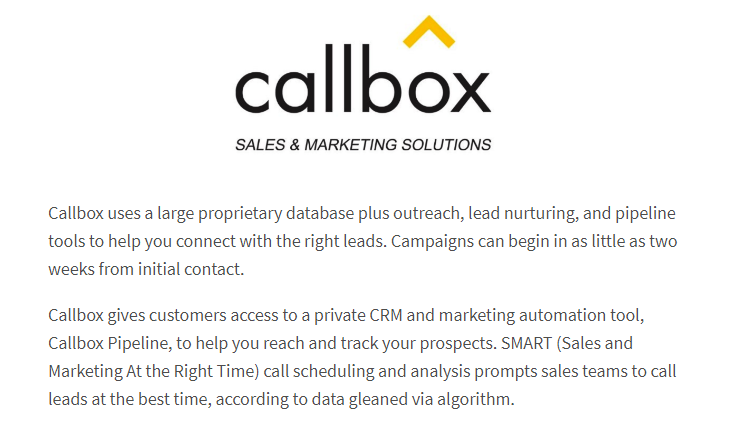 We’re very proud and thankful that Callbox continues to garner recognition and awards as a leading B2B marketing company. But the biggest recognition we always strive to achieve is the satisfaction our clients and partners get from working with us.